Vermont Sen. Bernie Sanders officially launched his presidential campaign Tuesday, railing against income inequality in America. He called it “the great moral issue of our time” and pledged to improve the lives of middle class Americans as president. In a half-hour speech, Sanders outlined a progressive agenda that included a major federal jobs initiative, a $1 trillion program to rebuild and invest in infrastructure projects nationwide, raising the federal minimum wage to $15 per hour, guaranteed sick leave and paid vacation days, and pay equity for women. Additionally, Sanders called for universal health care for all Americans via an expanded Medicare program that would guarantee coverage. 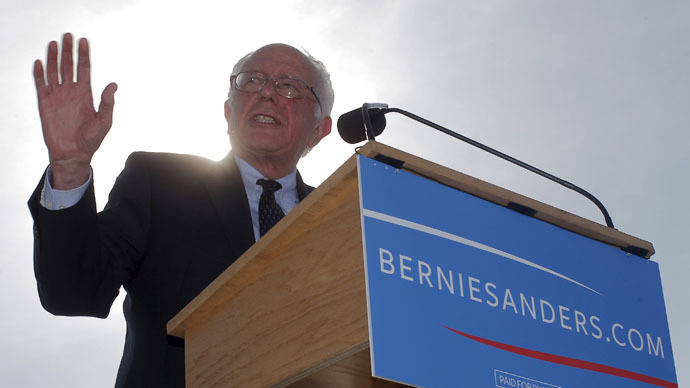 Social Security benefits would also be expanded under a Sanders presidency, he said. "Brothers and sisters, now is not the time for thinking small," he said. "Now is not the time for the same-old, same-old. Now is the time for millions of working families to revitalize American democracy” and end the decline of the middle class. Meanwhile, Sanders had harsh words for the wealthiest class of Americans and for large corporations. Calling the inequality gap “the great moral issue of our time,” the lawmaker said it is “unsustainable” and “profoundly wrong” that the top one-tenth of 1 percent owns almost as much wealth as the bottom 90 percent. He also criticized the influence of money on politics and called for a constitutional amendment to limit the amount of cash individuals can pour into political campaigns. He also vowed to create a system that requires wealthy individuals and corporations to pay their fair share when it comes to taxes. Criticizing Wall Street for “gambling trillions,” Sanders said big banks shouldn’t reach the point where they are too big to fail. On the controversial international trade deals the Obama administration is looking to shepherd through Congress, Sanders said simply that he would oppose current trade policies, claiming similar agreements in the past cost America millions of jobs to foreign nations. Unlike conservative lawmakers, Sanders did not hedge on the question of climate change. He pledged to implement a policy of “environmental sanity,” arguing that scientists have clearly determined climate change is real and caused by human activity. “If we don’t get our act together and have the US lead the world in combating climate change, there will be more drought, more famine … more extreme weather disturbances,” Sanders said. In terms of foreign policy, Sanders was light on detail. He promised to defend the US responsibly, noting that he voted against the invasion of Iraq in 2003. He declared opposition to “endless, perpetual war in the Middle East,” arguing the US should not have to bear burden of fighting the so-called Islamic State alone. He called for an international coalition against the extremist group, one led by Muslim nations. Sanders did not attack any of his political rivals by name, choosing instead to focus on domestic issues. The independent congressman is widely expected to use his unabashedly liberal views to push frontrunner Hillary Clinton to the left on various items, including trade policy and social issues, and to keep the spotlight on the plight of working Americans who still haven’t recovered from the 2008 financial crisis.